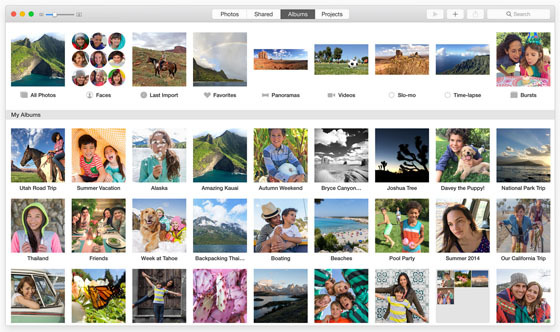 Apple’s new iCloud Photo Library allows you to seamlessly sync and store your photos across all of your devices. Whether you’re using an iPhone, iPad, iPod touch, or a Mac with the new Photos app, enabling the iCloud Photo Library means that you’ll always have access to your entire and most recent photo collection. You can even use iCloud on a Windows PC. In this article you’ll discover how to use the iCloud Photo Library to access all of your photos, no matter which device you’re using. You may already be familiar with iCloud if you use it to back up your iPhone’s data (including photos). iCloud is Apple’s cloud-based storage facility that allows you to store your files remotely and access them from a variety of devices via Wi-Fi. With the new iCloud Photo Library, every photo and video you take is now automatically stored in iCloud and synced to all of your other iCloud-enabled devices. This allows you to access your entire photo collection at any time, and from any iOS device (iPhone, iPad or iPod touch) or computer (Mac or Windows PC). 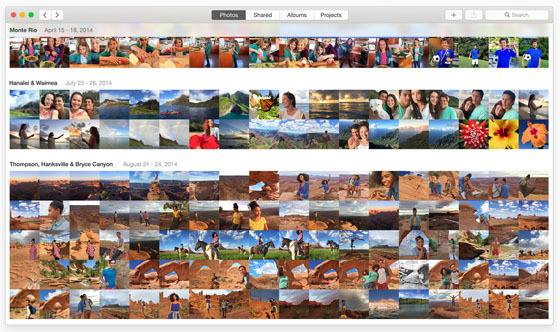 iCloud Photo Library is available on iOS devices running iOS 8.3 or later, and on Mac computers running Yosemite 10.10.3 or later. With this version of the Mac operating system you’ll have a new Photos app which works in a similar way to the Photos app on your iPhone. You must of course have enough available iCloud storage to save your photos (we’ll look at storage options later). On a Windows PC you can download the iCloud software to access similar facilities. Alternatively you can access your photos at iCloud.com from any web browser. Your iCloud Photo Library is organized in the same way across devices, making navigating your images a familiar experience no matter what device you’re using. 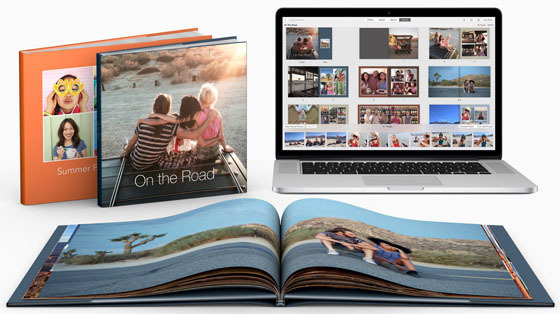 Your photos are organized into Moments, Collections and Years across all of your devices, and even on the web. Whenever you make changes on one device, those changes are automatically updated on all of your other iCloud-enabled devices. So if you create a new album in your iPhone’s Photos app, that album will appear in the Photos app on your other iOS devices and Mac. If you delete a photo from the Photos app on your Mac, that image will also be deleted from your iOS devices. You can create albums, mark images as favorites, and organize your photos whether you’re on your iPhone, iPad, iPod touch or Mac. And when you edit a picture using Photos, your changes are automatically uploaded to iCloud and will be visible on your other devices. 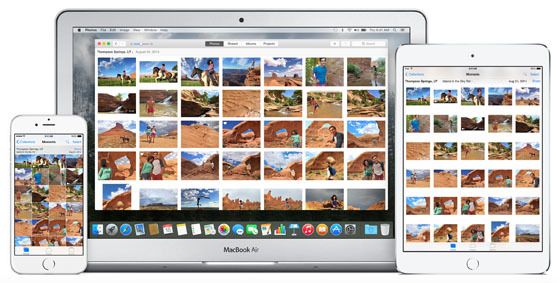 iCloud Photo Library can help you to free up space on your iOS devices and Mac. But first you need to ensure that you have enough iCloud storage to store your images. You get 5GB of free iCloud storage to start with, and then as your library grows you can upgrade to a different plan to get more storage as you need it. To check your current iCloud storage, open the Settings app on your iPhone, then go to iCloud > Storage. You’ll see the total amount of iCloud storage on your current plan, together with how much is available. If you need to upgrade to more iCloud storage, tap Change Storage Plan and select the option you want. You pay for iCloud storage on a monthly basis, and payment is taken automatically using the same method that you use for purchasing apps from the App Store. Price plans start at $0.99 per month for 20GB of storage. 200GB is $3.99, 500GB is $9.99 and 1TB is $19.99 per month. To automatically upload and store your entire iPhone’s photo library in iCloud, so that you can access all of your photos and videos from all of your devices, go to Settings > Photos & Camera, then switch on the iCloud Photo Library option. 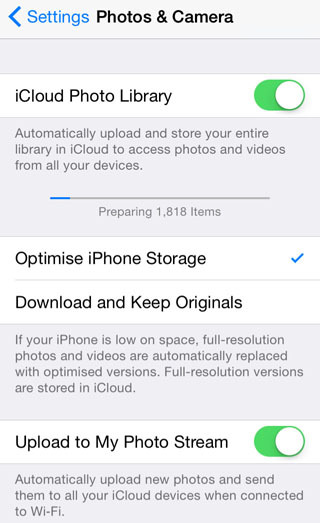 You’ll see a progress bar telling you how many photos have been uploaded to iCloud. This may take a considerable amount of time depending on how many photos you have on your device and the speed of your internet connection. Make sure you’re connected to Wi-Fi and that your phone has enough battery – keep the iPhone charging if possible. Beneath the progress bar you’ll see two options: Optimize iPhone Storage, and Download and Keep Originals. The first option allows you to upload your full resolution images to iCloud, and then replace the images on your iPhone with optimized versions that take up less space. This is great if your iPhone is running low on space. If you choose to Optimize iPhone Storage, full resolution images are automatically downloaded from iCloud onto your device whenever you want to view, edit, email them, etc. Obviously you have to have a Wi-Fi or cellular internet connection to be able to download them from iCloud in this way. If you’d prefer to keep the original full resolution images on your iPhone, select Download and Keep Originals. The benefit of this is that you’ll have access to the full resolution images stored on your iPhone even when you don’t have an internet connection. However, be aware that your iPhone’s storage capacity will fill up more quickly if you select this option. These same options are available on the iPad and iPod touch, so if you have any of these devices, ensure you switch on the iCloud Photo Library on these devices to take full advantage of being able to access all of your images from all of your devices. When you next open the Photos app on your iPhone (or other device) don’t panic when you notice that your Camera Roll has disappeared! When you have iCloud Photo Library switched on, the Camera Roll album is replaced with an All Photos album. This is because it no longer only contains photos taken with the camera on that particular device – it now has all of your images from all of your other devices that have iCloud Photo Library enabled. Photos and videos in the All Photos album will be organized by the date you added them. 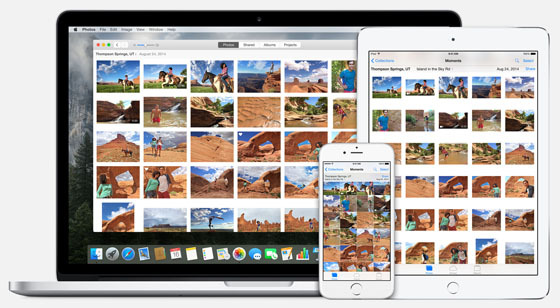 If you have a Mac running Yosemite 10.10.3 or later, you can switch on iCloud Photo Library so that all of your images from your iOS devices will appear in the Photos app on your Mac. Just click the Apple menu at the top left of the screen, go to System Preferences > iCloud > Options next to Photos, then select iCloud Photo Library. To specify the storage options for Photos on a Mac, open the Photos app then go to the Photos menu at the top left and select Preferences. Go to the iCloud tab where you’ll be able to choose from two options: Download Originals To This Mac or Optimize Mac Storage. You can now use the Photos app on your Mac just like you do on your iPhone. Clicking on the Photos tab at the top of the screen will display all of your photos in either Years, Collections or Moments. Use the back and forward arrows at the top left to switch between these different views. The Albums tab allows you to view the albums that you’ve created in the Photos app on your iPhone or other iOS device. 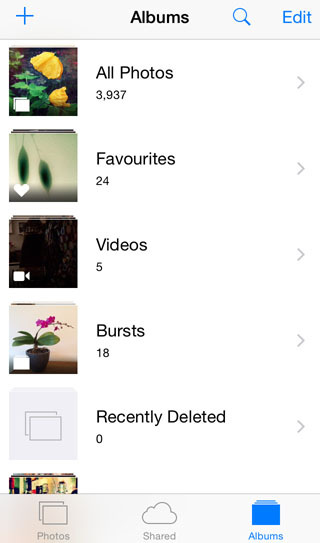 You can create new albums and organize your photos, just like you can on your iPhone. The Photos app on the Mac even allows you to edit your photos in the same way as the Photos app on your iPhone, including filters, lighting and color adjustments, cropping, and even a retouch tool. Simply double click on a photo, then click Edit at the top right. Remember, all of your edits will automatically appear on your other iOS devices. Edits are non-destructive so you can revert back to the original at any time. If you have photos in folders on your computer that you’d like to store in the iCloud Photo Library, you can import them into the Photos app. Once imported, they’ll automatically appear in the All Photos album on your other iOS devices. To import photos, go to File > Import, select the images or folders you want, then click Review For Import, then click Import All New Photos. If you want to copy the full resolution images from the iCloud Photo Library into a folder on your computer, select the images in the Photos app on your Mac, then go to File > Export. You can choose to export the photo as it is (including any edits), or the unmodified original. In the next dialog box select your preferred options, then click Export. Select the folder you want the images to go into, then click Export. What If You Don’t Have A Mac? The iCloud Library is designed to work seamlessly between Apple devices, so if you have a Mac computer you simply use the Photos app to view, organize and edit your images in the same way as you do on your iPhone. If you have a Windows computer, you can still take advantage of the the iCloud Photo Library, although you don’t get a Photos app like you do on the Mac. To enable iCloud on your Windows PC (Windows 7 or 8 required), first set up your iCloud account on your other iOS devices or Mac, then download iCloud for Windows from the Apple website and install the software on your PC. Once installed, open iCloud for Windows and sign in with your Apple ID. Select the iCloud services you’d like to enable, including Photos, and click Apply. When you enable iCloud Drive and Photos, iCloud for Windows creates new folders for those files in Windows Explorer. When you save new files into those folders, the files will also automatically appear on your iPhone and other iOS devices. Another option is to access your entire photo library from the Photos app on iCloud.com. Simply sign in with your Apple ID, then click Photos on the control panel as shown below. You can access this from any web browser, but you might not be able to play MP4 videos with Firefox. If you experience problems, try using a different browser (Safari 8 or later, or Google Chrome 28 or later). With iCloud Photo Library it’s easy to share your photos with other people. Simply open the Shared tab in the Photos app on any device, then create an album, add photos to it, then invite friends to join the album. You can even allow them to add their own photos to a shared album, and people can like and comment on the photos. With the Activity view in the Sharing tab of the Photos app, you can see all the updates and comments in your shared albums, no matter which device you’re using. If you’re using Photos on a Mac, the Projects tab allows you to create professional-looking photo books, cards, calendars, prints and slideshows with your images. As you can see, the new iCloud Photo Library and Photos app make it much easier to access all of your photos from all of your devices. It ensures any changes you make to photos or albums are automatically reflected on every iCloud-enabled device, no matter where you made those changes. If you have a Mac, the syncing and storage of photos works seamlessly between this and your iOS devices. So you no longer have to worry about transferring your iPhone photos to your computer – they’ll automatically appear in the Photos app on your Mac via iCloud. If you struggle with editing your iPhone photos on a small screen, the ability to edit them via the Photos app on your Mac will be of great benefit. Add to that the ability to organize, share and create printed projects, and you’ll probably agree that the Photos app for Mac is a seriously great addition. I’ve been using iCloud Photo Library and the new Photos app on my Mac and iOS devices, and I’m hooked! Even if you have a Windows PC, the iCloud for Windows software and the Photos app on iCloud.com make it easy to access and sync photos between your iOS devices and computer.